I swear Tom Schneider is really starting to piss me off. He knows full well I have little intention of trying to cover the WSOP this year … but damnit, I came up with that strategy kinda-sorta counting on a lackluster performance by our longtime Team Pokerati ambassador — a near certain result as per performance indicators over the past four or so years! But now, like right now, he’s well on his way to taking down trying hard to take down his second bracelet and/or 6-figure score. With now only five players left, I’m fairly certain he’s gonna win this one, the way he’s barreling through this final table … Greg Mueller, I’d say, is his only threat, as I’ve seen him beat Tom heads-up before with a lot on the line. Though I don’t know the WSOP statistical lore on this one, it would be a rather amazing feat to win a $1,500 HORSE event, and then the $5,000 HORSE, no? And not to get ahead of anyone, but a repeat POY maybe? OK, I’ll cut with the jinxing as Schneider-Mueller have dropped from 1st/2nd in chips to 3rd/4th with four left in the time it has taken me to write this paragraf. 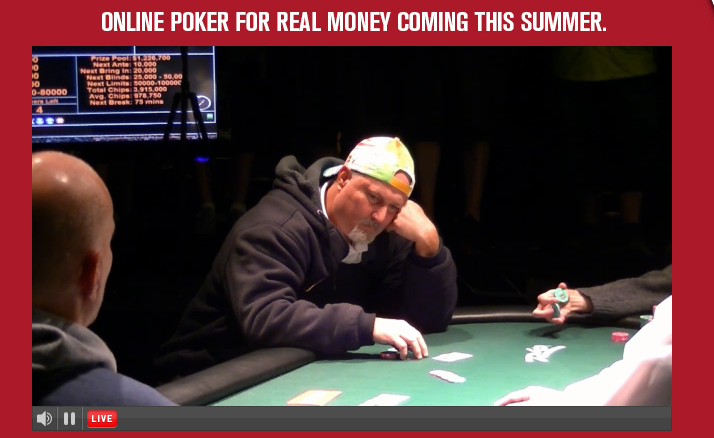 UPDATE: Now Tom is short, and FBT is chip leader … while the hat tells pretty much the whole story. 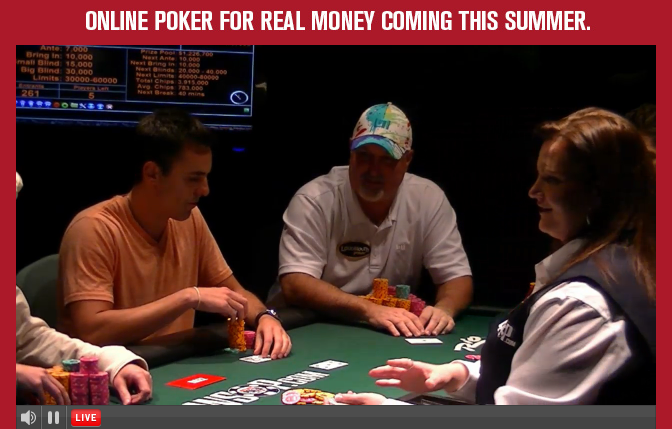 UPDATE: Back and forth back and forth … Tom is dominant chip leader now, with hat, um, re-unreversed? UPDATE: Final four coming back on Tuesday, with Tom in strong position. Day 2a concluded with 607 players remaining and Andrew Gaw the chip leader with 386,800 in chips. In an interesting story, Eric Cloutier, who was reported chip leader at the end of day 1a with 150,750 in chips, turned out to have 15,075 to start the day. He ends today in 2nd place with 383,500 in chips. Other notables: Greg Mueller (287,300), Andy Black (215,700), Mike Sexton (169,000), Kara Scott (139,500), Jimmy Fricke (138,300), Tom Schneider (123,700), Greg Raymer (95,900), Jason Alexander (73,700), Sam Farha (67,500), Erik Seidel (55,600) and Roland de Wolfe (21,200). To view the entire list of day 2a survivors, follow this link. Frustration was boiling over among those who felt their dreams of championship glory moving beyond reach, many feeling betrayed by what they saw as insufficient warning of what might be going down. Yet O’Donnell did get a seat — at Amazon Green 156 — and returns today with more than 72,000 in chips. Day 2b gets underway at noon today, playing 4 two-hour levels. A not exact list of chip counts and where they’ll be sitting can be found here. If you’re in the Amazon Room and poker room, you’ll be playing 9-handed. Buzio’s and any of the other tournament rooms will mostly start 10-handed, although they’ll be breaking tables as fast as they can to get to 9-handed as quickly as possible. One of the tables not in use at the moment, Amazon Green 156. Follow the live updates at www.wsop.com and other updates from Pokerati about other goings on at the WSOP. Greg Mueller becomes the fourth double bracelet winner at this year’s WSOP, taking down the $1,500 Limit Holdem Shootout, good for $194,854 as he denied Marc Naalden his second bracelet this year. The only year where more players have won more at least two bracelets was 2003 (Ivey, Juanda, Men Nguyen, Ferguson, Chan and Flack) . Millie Shiu finished in 3rd, tied for the highest placing woman in an open WSOP event this year(Ming Reslock in the $1,500 Omaha-8 and Laurence Grondin in the $2,000 NL Holdem). David Williams finished in thirdfourth..
Day 3 of the $1,500 NL Holdem starts with 30 players remaining, with Thibaut Durand (1,650,000) holding the chip lead when play resumes around 1pm PT. Owen Crowe (1,025,000), Josh Schlein (875,000), and Alex Jacob (274,000) are the most recognizable names remaining. 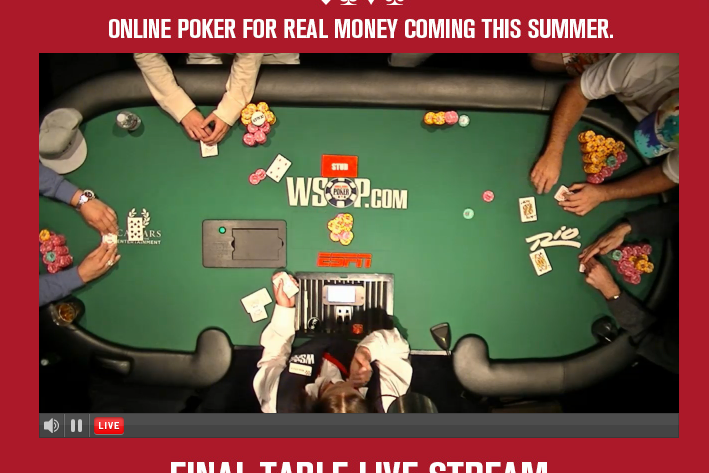 When the final table is eventually reached, bluffmagazine.com and wsop.pkr.com will stream all the action. Day 1 of the $3,000 Triple Chance NL Holdem ended with 149 players remaining and it’s two Australians who hold the top spots when play resumes around 2pm today. Tim Horan is the chip leader (149,000), followed by Harris Pavlou (137,300). Notables returning on day 2 include Jeff Lisandro, Antonio Esfandiari, Shane Schleger, Nick Binger, Mike Caro, Noah Schwartz and Praz Bansi. Day 2 of the $1,500 Stud Hi/Lo 8 or Betterevent resumes around 2pm with 146 players remaining, with Allie Prescott leading the field with 52,500 in chips. Notables returning include Jim Geary, Annie Duke, Marcel Luske, Daniel Negreanu, Barry Greenstein, Jon Turner, Matt Savage and Norman Chad. The 12pm $1,500 NL Holdem Donkament is already sold out, although there’s always the slim chance they’ll open a few more seats during the day. This is the seventh event of the $1,500 NL Holdem of this year’s WSOP, so it’s a “new” event, not having a winner last year. The 5pm (if it starts on time) event is the $2,500 2-7 Triple Draw Lowball event, won last year by John Phan for just over $150,000 in a field of 238. The WSOP Staff Guide projects a field of 262 entries. Today and tomorrow will both be extremely busy with six tournaments going on at the same time, so check out www.wsop.com for live updates, and Pokerati for other stuff during the day. The final table of the $1,500 Limit Holdem Shootout has 6 players remaining after returning from their dinner break. Greg Mueller is the current chip leader (950,000), followed by Marc Naalden, Millie Shiu, David Williams, Flaminio Malaguti and Matt Sterling. Erik Sagstrom, an early Internet poker sensation, is the current chip leader (1,280,000) of the $50,000 HORSE with 31 players remaining. Ville Wahlbeck (775,000) is in 2nd place, followed by Vitaly Lunkin (735,000) in 3rd as the players take their dinner break. Day 2 chip leader Gus Hansen (670,000) is still in the top 10, along with Todd Brunson (610,000) and Freddy Deeb (560,000). Jason Helder (440,000) is the current chip leader in the $1,500 NL Holdem with about 120 players remaining as they try to play down to 9 before the 3am deadline. Notables with chips left include Men Nguyen, Cody Slaubaugh, Jason Potter, Owen Crowe and Vinny Pahuja. A field of 854 started today’s debut of the $3,000 NL Holdem Triple Chance event, with a field of approximately 400 remaining. No chip leader has been named yet, but the updates say that there’s a few players with stacks of 70,000 from their starting stacks of 9,000. A field of 467 showed up for the $1,500 Stud 8 or Better event that started at 5pm, they have eight levels of play today, with the only notable casualty so far being Perry Friedman. Check out www.wsop.com for more updates, and some stuff overnight from Pokerati. Tom Schneider (front) may have been the crowd favorite, but FBT (far table) is still having a better 2009 and shut down Schneider’s hopes for redemption as the DonkeyBomber fan base looks on. So close … but in the end, Tom missed the final table in the $1,500 Limit Hold’em Shootout event — losing heads-up in a hard-fought battle to Greg FBT Mueller. So rough, too … he played so well, fought so hard … so much money not won. NOTE: Tom says things turned on the first dealer error he’s encountered the whole Series (which sounds like a lot of clean cards for a long time, but not really when you go out around dinner break in most of your 19 events). Tom got dealt 3-3 … Mueller had 7-7 … but one of the 7s got exposed, so his new card was 3s. They were at 8k/16k, and a 3 and two spades came on the flop, giving Tom a set, and FBT a pair with a flush draw. Tom bet, Mueller called. Blank on the turn; Tom bet, Mueller called. Spade on the river = flush for FBT, compliments of his burn-card 3. 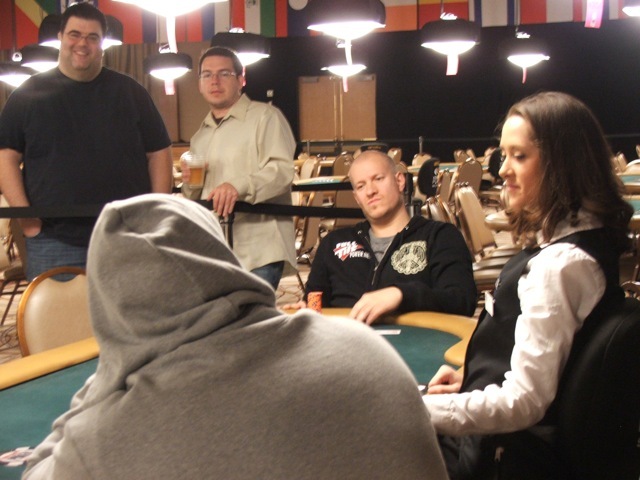 After a valiant 0-for-18 start, with only one Day 2 in the mix, everybody’s favorite @DonkeyBomber has finally made the money — winning his first-round table in the $1,500 Limit Hold’em Shootout, an event he finished 5th in back in 2006. Yep, it’s a guaranteed $4,350 payday ($2,850 net). We know he’s got a long way to go against a bunch of other tough pros to stop the bankroll-bleeding … but c’mon, golf-clap … baby steps. Now all he needs is a third-place finish (or maybe second) to get him pretty close to even for 2009 WSOP tourneys. … and a lot of others that have 2-4 WSOP cashes under their belts. If you tally up Hendon Mob Results and WSOP hardware for all the players still left (64 out of 572), this table represents the 1st most difficult out of 8. Must-win. For those who missed it live … here’s yesterday’s Poker Beat podcast to get you through “the grind”, the hump, the “dog days”, whatever you wanna call the Series in mid-June. In this episode, we discuss what a bracelet really means to a guy like Greg Mueller, just how good really is JC Tran, and, in this Year of apparent Multiples, what’s a guy like Roland deWolfe all about? Also … “Full Tilt’s” lawsuit (via Kolyma) vs. an Aruba-Aussie payment processor run by 25-year-old Crocodile D-bag … and “celebrity” tournament director Matt Savage joins us to discuss the TDA Summit — and specifically rule changes related to texting at the table. Sorry for the slowdown in getting podcasts to you. For those who can’t always handle semi-informed snarky banter for more than 2-4 minutes at a time and need more vulgarity and shticked-up grit, Tao of Pokerati (brought to you by Dream Team Poker) will also be back very soon. It seems fitting that Greg “FBT” Mueller won his bracelet on “hockey day” — being that he’s a former professional hockey player. I’m sure that will make his win last night in $10k Limit Hold’em all the more memorable. The Stanley Cup’s presence will also make the 2009 WSOP a special one for Mean Gene, who took this fawning pic of the silvery list of hockey champions in front of the silvery wall of poker champions, as well as others with the Cup in the Amazon Room. I do suppose it isn’t often when an inanimate object gets such celebrity treatment. Angel Guillen picked up his first WSOP bracelet in the $2,000 NL Holdem event, defeating Mika Paasonen in a marathon heads up match to deny Finland a second WSOP bracelet. Guillen adds over $530,000 for first place, and throws his name into the Player of the Year race, as he had a 2nd place finish in the $2,500 NL Holdem event two weeks ago. The $10,000 Limit Holdem World Championship ended with a 1-2 finish for Canada, as Greg “FBT” Mueller passed Pat Pezzin to win his first WSOP bracelet. Mueller, a former hockey player, mentioned he was inspired by the Stanley Cup making an appearance at the WSOP on Wednesday, saying it was his destiny to win after having made several WSOP final tables, and two second place finishes in previous attempts. The $1,500 NL Holdem event heads to its conclusion at 1pm today with 21 players remaining, and Dane Jonas Klausen holding the lead with 939,000 in chips. Swede Martin Jacobson starts in second (806,000) with Roland de Wolfe, (644,000), Eric Baldwin (610,000), Bertrand “Elky” Grospellier (414,000) and Young Phan (211,000) among the notables remaining. When they eventually make the final table, it’ll be streamed over the Internet at www.bluffmagazine.com/live and wsop.pkr.com. Another Dane, Jesper Hougaard will lead the 64 returning players who resume at 2pm in the $5,000 Pot-Limit Omaha event with 208,500 in chips. Sorel Mizzi (177,000), Jeff Lisandro (162,500), Sandra Naujoks (157,000), David “Devilfish” Ulliott (140,000) and John Kabbaj (95,700) are some of the notables looking to make the money, which will be reached when 36 players remain. Two tournaments kick off on Thursday, starting with the $2,000 NL Holdem event at 12pm, which was won last year by Alexandre Gomes in a field of 2,317. The $10,000 Stud Eight or Better World Championship commences at 5pm, which was won last year by Sebastian Ruthenberg in a field of 261 when the buyin was $5,000. The WSOP Staff Guide projects a field of 2,549 for the $2,000 NL (expect a field of 2,100), while the $10,000 Stud 8 World Championship field is projected at 150 (take slightly under, 135). Come back to Pokerati during the day for more WSOP stories, and follow the live updates at www.wsop.com starting at 12pm today.